On Tuesday 10th April all of the classes had the opportunity to cook with Pauric Yore from The Forge Restaurant. The children made brown bread, vegetable soup & omelettes. Pauric discussed where all the ingredients came from, how the food is prepared & how it should be cooked & served. 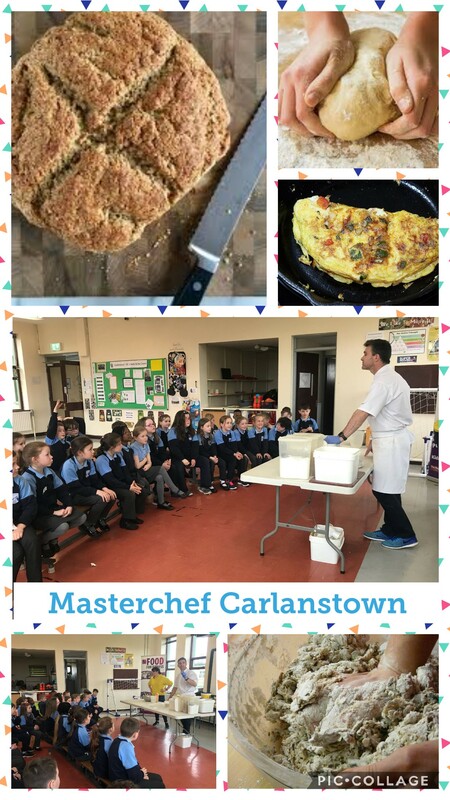 With the older classes Pauric discussed sustainable food sources, vegetarian & vegan diets, the concept of food miles and the science behind the dishes they cooked. The teachers learned lots too!! The children were hands on during the demonstrations, kneading the dough & whisking the eggs for the omelette. According to the children the tasting was the best part!